Contact lenses are thin plastic discs made from hydrogel or silicon hydrogel. Contact lenses are used by individuals for vision correction caused due to myopia, presbyopia, astigmatism, and other forms of vision disorders. Increase in incidence and prevalence of vision disorders among the young generation due to unhealthy lifestyle, along with new product development and technological innovation are expected to drive the global contact lens market during the forecast period. The global market was valued at US$ 11,155.7 Mn in 2017 and is expected to expand at a CAGR of 7.4% from 2018 to 2026. The U.S. FDA has classified contact lenses as class II and class III medical devices based on usage. Regular wear contact lenses are classified as class II medical devices by the U.S. FDA, as these pose less risk to individuals when used without correct physician advice. Contact lenses worn for an extended period of time are classified as class III medical devices, as these pose a higher degree of risk to an individual’s health and safety when used without correct physician advice. Contact lenses are used for vision correction, and for cosmetic and esthetic purpose to change the color or appearance of eye. These are coated with anti-refractive materials, scratch resistance materials, and ultraviolet protection materials to improve the therapeutic benefits of lenses and provide comfort to the individual. Different types of contact lenses are available in the market depending on the needs of individuals. The global contact lens market has been segmented based on technology, product, design, and region. In terms of technology, the global market has been categorized into spin casting, cast molding, and lathe cutting. Based on product, the global contact lens market has been bifurcated into soft lenses and gas permeable lenses. The soft contact lenses segment is projected to account for major market share during the forecast period. The gas permeable lenses segment is anticipated to expand at a higher CAGR due to rise in incidence rate of corneal irregularities and astigmatism. In terms of design, the global market can be classified into spherical, toric, multifocal, and others. The spherical segment is expected to capture major market share during the forecast period. However, demand for multifocal lenses is likely to increase from 2018 to 2026. According to the American Optometric Association, nearly 123 million individuals in the U.S. are projected to be affected by presbyopia by 2020. In terms of region, the global contact lens market has been segmented into North America, Europe, Asia Pacific, Latin America, and Middle East & Africa. North America is expected to account for major share of the global market during the forecast period, followed by Europe. Increase in product launches and expansion strategies adopted by major manufacturers in the contact lens market are attributed to the dominance of North America and Europe during the forecast period. The contact lens market in Asia Pacific is anticipated to expand at a higher CAGR during forecast period from 2018 to 2026. Rise in demand and increased participation of regional players in the region are anticipated to drive the market in the region during the forecast period. The contact lens market in Latin America and Middle East & Africa is expected to be driven by rise in demand for cosmetic contact lenses and custom lenses during the forecast period. Major manufacturers have established their market position in the global contact lens market through increase in product development and introduction of efficient contact lenses. These manufacturers have a wide range of products and have a well-established distribution channel across the world. Increased participation by a number of regional players, especially in the emerging markets in Asia, the Middle East, and Latin America is anticipated to boost market growth. Increase in mergers and acquisitions, and strategic partnerships between public private organizations are expected to drive the market during the forecast period. For instance, in 2016, CooperVision acquired Soflex, a soft contact lens manufacturer based in Israel. The acquisition is expected to expand the company’s geographic presence and product portfolio. 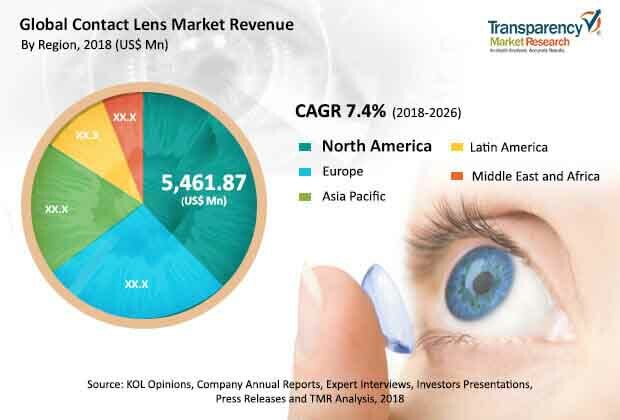 Major players in the global contact lens market are Johnson & Johnson, Alcon (Novartis AG), The Cooper Companies, Valeant Pharmaceuticals (Bausch + Lomb), Menicon Co. Ltd., STAAR Surgical, SynergEyes, Inc., Essilor, and Hoya Corporation, among others. This report analyzes the current and future scenario of the global contact lens market. Increase in product development, rise in demand for contact lenses in developing and developed countries to address vision disorders such as myopia, presbyopia, astigmatism, color blindness, and surge in research for developing technologies for production of more comfortable lenses are the major drivers of the global contact lens market. The global contact lens market report comprises an elaborate executive summary, which includes a snapshot that provides information about various segments of the market. It also provides information and data analysis of the global market with respect to the segments based on technology, product, design, and region. A detailed qualitative analysis of drivers and restraints of the market and opportunities has been provided in the market overview section. Additionally, the section comprises competitive matrix and company profiles with business overview to understand the competitive landscape in the market. This section of the report also provides market attractiveness analysis by region and market share analysis by key players, thereby presenting a thorough analysis of the overall competitive scenario in the global contact lens market. Based on technology, the global contact lens market has been segmented into spin casting, cast molding, and lathe cutting. These segments are analyzed based on technological development in manufacturing. In terms of product, the global market has been bifurcated into soft lenses and gas permeable lenses. These segments have been analyzed based on available product categories in the contact lens market, cost-effectiveness, and preference based on type of vision correction required. Based on design, the global contact lens market has been classified into spherical, toric, multifocal, and others. The market size and forecast for each of these segments have been provided for the period from 2016 to 2026, along with their respective CAGRs for the forecast period from 2018 to 2026, considering 2017 as the base year. The report also profiles major players in the global contact lens market based on various attributes such as company overview, financial overview, product portfolio, business strategies, and recent developments. The major players in the global market are Johnson & Johnson, Alcon (Novartis AG), The Cooper Companies, Valeant Pharmaceuticals (Bausch + Lomb), Menicon Co. Ltd., STAAR Surgical, SynergEyes, Inc., Essilor, and Hoya Corporation, among others..